When we are grieving for a loved one, sometimes it’s a complete stranger who can lift our spirits by extending us friendship when we least expect it. 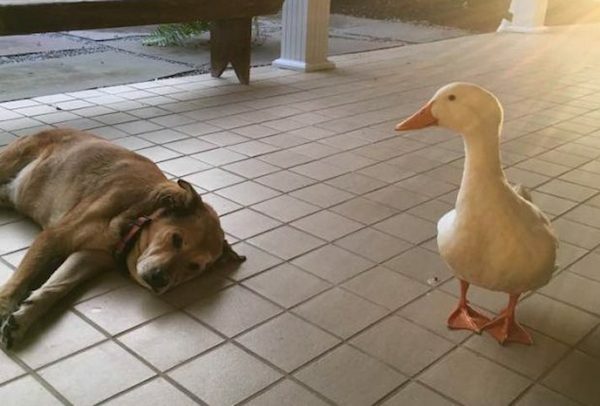 This is exactly what happened recently between a depressed dog and a friendly duck. Two years ago, a dog named George lost his partner, Blackie. The two dogs had been together for 12 years, explains George’s human Jacquie Litton. George was devastated and became depressed. “George has been heartbroken and has grieved with anxiety so bad that he has almost died twice,” Jacquie explains on Facebook. Then a duck appeared out of nowhere and approached George. 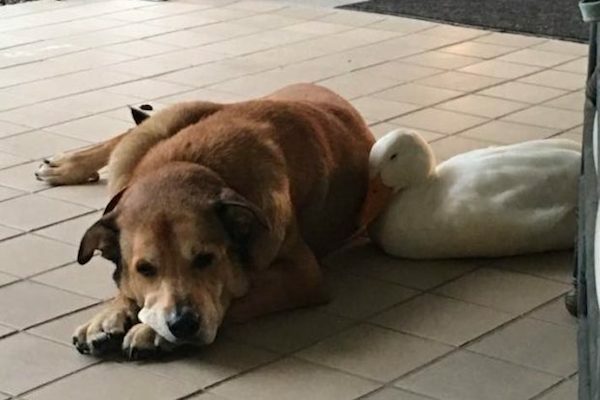 “We have no idea where this duck came from but he sure does love George and since the duck has arrived George has not cried one time,” says Jacquie. 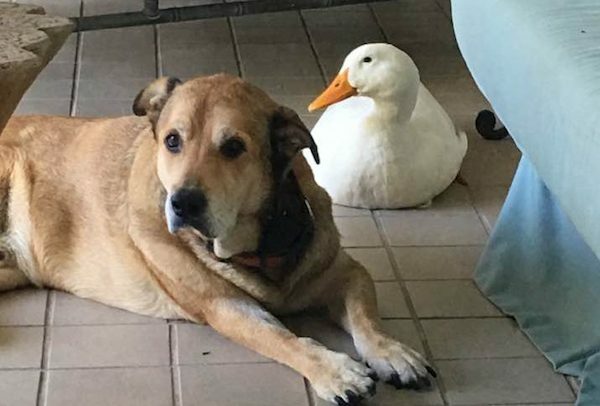 “It is strange for a Duck to just appear at our house and be attached to your dog and even more strangely the anniversary week of Blackie’s passing,” she adds. 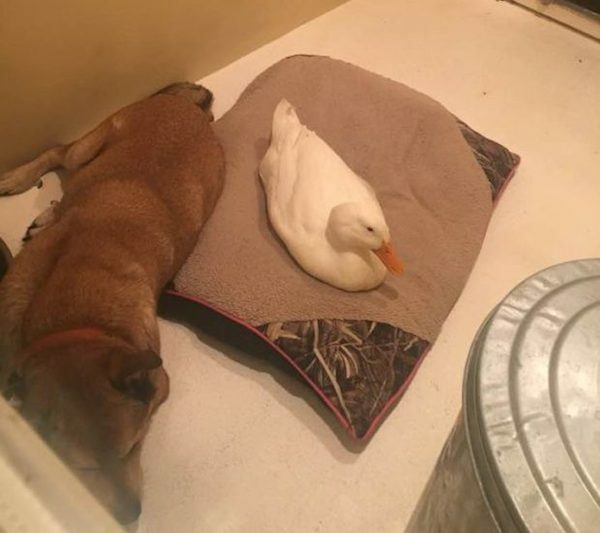 Since arriving the duck, nicknamed “Donald”, hangs out with George and George likes his new companion. 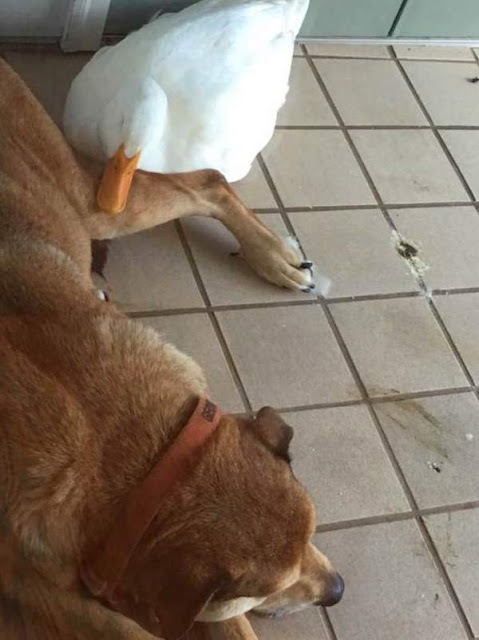 Donald feels comfortable enough with George to rest his bill on the dog. The two also go on walks together. 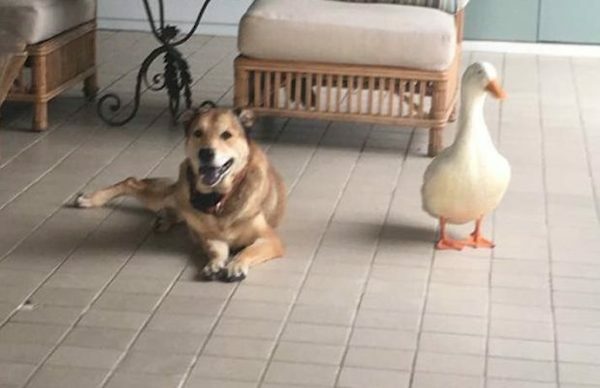 Jacquie told WVLT Local 8 that the pair will be walking together with Donald quacking and George looking at him and she says “you wonder if they’re really having a conversation”. The two love to hang out on the porch together. I’m sure George is hoping his newfound friend sticks around too! And from the looks of things, Donald isn’t planning on going anywhere. Share this heartwarming, healing friendship with your family and friends!